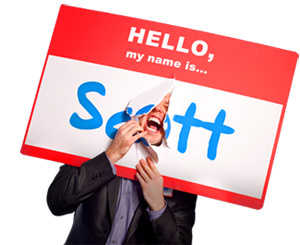 How to Communicate That You're Fully Committed, Part 2 - HELLO, my name is Scott! Most people have heard this riddle before, although few know the origin of the phrase. It comes from a book published in 1710 by George Berkeley called A Treatise Concerning the Principles of Human Knowledge. The existential question he poses throughout the text is: Can something exist without being perceived? His theory is that if you have a message to share – but never share it – you never really had it in the first place. The tree never (really) fell. And I think for anyone in a leadership position – personally or professionally – the “tree in the forest theory” is especially relevant when it comes to the topic of commitment. Commitment is the cornerstone of good character. Commitment is the keynote of inspirational leadership. BUT HERE’S WHAT MOST PEOPLE MISS: Commitment requires consistent, visual and emotional reinforcement. THEREFORE: The problem is not a fear of commitment; the problem is a failure to communicate that you’re fully committed in the hearts and minds of the people who matter. 1. Money doesn’t talk – it speaks. It’s not a panacea, but boy is it effective for attracting people’s attention to your commitment. In two different ways. First, let’s go back to the nametag tattoo example. Remember how I started making money when I (finally) committed with both feet? 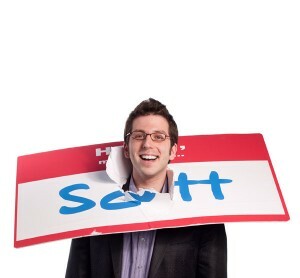 Interestingly, something else happened when I started making money: People stopped making fun of me for wearing a nametag. Especially after I was interviewed on 20/20. To my surprise, the news anchor unexpectedly reported that my nametag idea “converted a simple idea to a six-figure enterprise,” as he said. And wouldn’t you know it? That single fact was the one part of the interview most viewers commented about. Yep. People pretty much shut their mouths after that. My question is: How are you quantifying your success financially? You don’t have to lead with it. But it’s a nice ace to have up your sleeve when you feel the occasional need to prove your ruthlessness. The other side of the coin (rim shot!) is when you offer money as a gift – or put money up as an investment – to communicate your commitment. Whether you’re donating to a cause, investing in a business or putting down a deposit on a loan, if you want to watch money speak volumes, write someone a check. After all, commitment isn’t just about the money you accumulate – it’s about the money you allocate. How differently will people react to your commitment once money comes into the equation? 2. Invest your time; earn people’s trust. Another currency that speaks volumes is when you give up the precious commodity you have: Time. Here’s the equation: When people see you consciously investing (not frivolously spending) valuable, billable time on actions that support your commitment, they start to doubt your devotion a whole lot less. That’s one of the reasons I remind my audience members that I spend ten to twenty hours prepping each presentation: Because I have a responsibility to rock their faces off. Similarly, that’s one of the reasons I spend four to seven hours, every day, writing: Because I’m dedicated to my craft. What about you? How can you quantify your time investment (hours, days, years) and displaying it publicly? Take my friend Sal, a magician, who publicly logs tens of thousands of practice hours for each of his individual tricks on his website. I wonder if his clients believe in his commitment to performance excellence. Remember: The real magic trick is when you publicly and transparently articulate the effort required for your accomplishments. That’s the best way to help the people who matter hear your commitment message. What time can you invest to communicate your commitment to the people who matter? Hell, enter it into your daily calendar. Or post it publicly. Might be a cool way to keep yourself accountable. Also, remember to declare – and document – your boundaries. This ensures your commitment isn’t compromised. You might consider keeping a Commitment Log, in which you make nightly entries indicating moments in which you stuck to your commitment throughout the day. I’ve done this every morning of my life for the past eight years. Not only is it a ritual reinforcement of healthy boundaries, it’s a confidence booster when adversity rears its hideous little head. How will you remind yourself of your daily commitments? Because of our instant gratification culture, we’re impatient. Because of our privileged upbringing, we developed a mediocre work ethic. Because of our self-reliant, entrepreneurial bent, we don’t offer loyalty easily. And because of our abundance of choices, we’re quick to quit and pursue something better. Which of your fears are diminishing your willingness to communicate your commitment? Are you afraid of failing publicly? Terrified of being held accountable privately? Concerned that your sixty employees will eventually discover your secret obsession with World of Warcraft? Here’s a hint: You can’t pretend that people aren’t noticing. Your commitment – or lack thereof – colors and shapes every choice you make. What are your actions silently telling people you’re (really) committed to at this moment? REMEMBER: Commitment is nothing other than persistence with a purpose. Commitment is useless if not consistently communicated. Commitment is irrelevant when the thing you’re committed to hurts people. Commitment is worthless without the effective capacity to invest in and implement it. On the other hand, commitment is a lifestyle that, if executed daily, becomes an equitable reputation – a tree falling in the forest – that the people who matter, hear. How will you communicate that you’re fully committed?